Everyone loves short ribs. They are succulent, savory and packed full of flavor. You have to slowly cook them over a long period of time to allow all the muscles, fibers and fat to melt into the meat. This leaves you with a meat that almost falls apart on touch! That is what you have here with this Rotisserie Smoked Short Ribs recipe. Ready for Some Rotisserie Smoked Short Ribs? Slowly roasted for 5-6 hours at 250F, you get a delicious and tender short rib with a massive bark on the outside. Made my Rotisserie Smoked Short Ribs using my Chipotle Garlic Rub because it is a perfect pairing with the Hippie Cow Beef. Both are natural and full of real flavor. Also try my BBQ Lamb Ribs too! You might be wondering why I put the beef on the rotisserie? Truth is, I believe that it will help to cook all sides of the meat. Give you this constant rotation so that you have the juices rotate around and fall back into the Hippie Cow Beef. 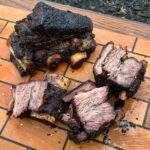 All in all, I think you will love to try this Rotisserie Smoked Short Ribs recipe! Just make sure you know the kind of meat you are cooking with! WHO IS HIPPIE COW BEEF? Hippie Cow Beef is all about raising happy cows that equate to healthy beef. They want to simplify the beef industry into high quality meat that is pasture born, pasture raised, non-GMO, non-feedlot, quality tasting animals. They are pushing towards the new standard for beef. That is why I used them for my Rotisserie Smoked Short Ribs recipe. You should be aware of everything that you eat, especially meat. 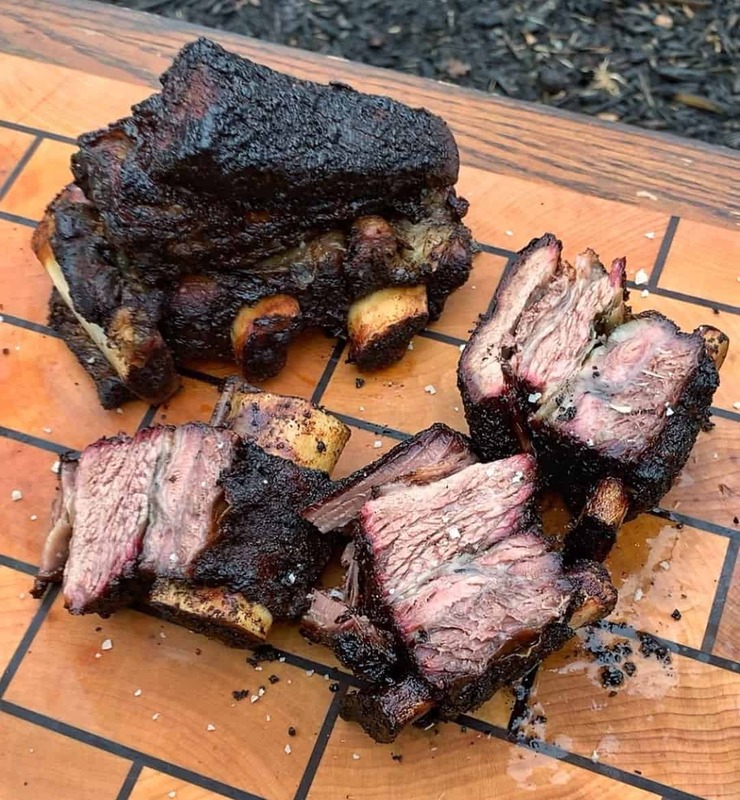 If you want the best for you health and for your Rotisserie Smoked Short Ribs recipe, then you should be eating the best that the meat industry has to offer. That is why I am working with Hippie Cow Beef to show off just how amazing their beef can taste! 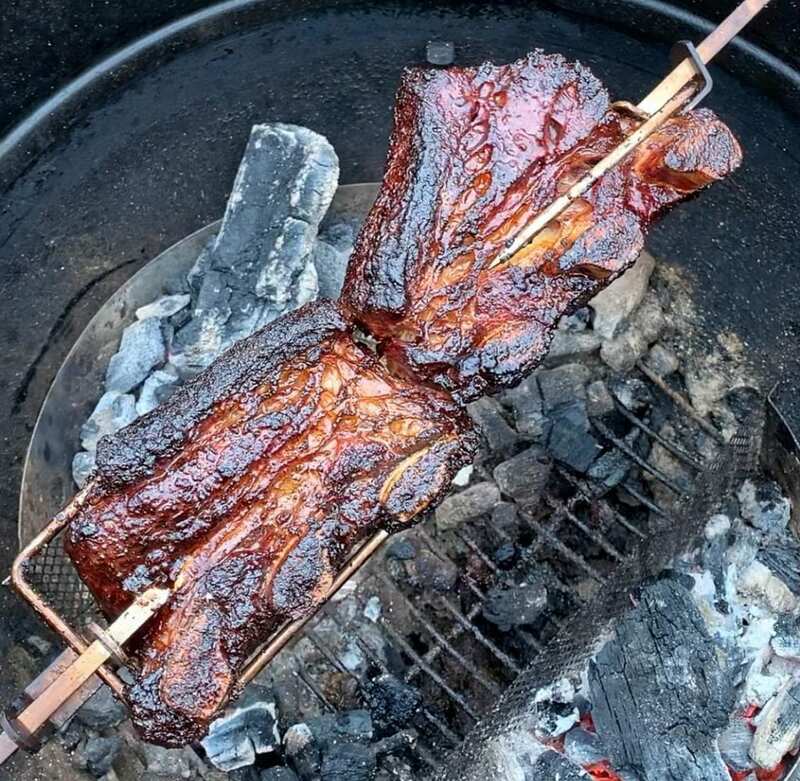 Try my Rotisserie Smoked Short Ribs on your grill now. They are grilled to make sure you get both smoky and savory flavors on your beef ribs! Build a medium-high heat fire for indirect grilling in a smoker of covered grill. Season short ribs with olive oil then Chipotle Garlic Rub. Skewer onto rotisserie sword. Add ribs to grill and smoke at a low temperature (250F) for about 5-6 hours. Once internal temperature reaches 205F, pull ribs off, wrap in tin foil, place in a cooler and let rest for 60 minutes. Pull out steak, slice and enjoy! Equipment: Hippie Cow Beef Short Ribs, rotisserie, grill, cutting board, knife, charcoal and tongs. Add chimichurri for more flavor!